This is a rotating tool organizer with slots and holes for tools of various sizes. There is also a hollow in the top shelf for storing things like 16″ rulers. It weighs about 7 pounds and has a smooth bottom. 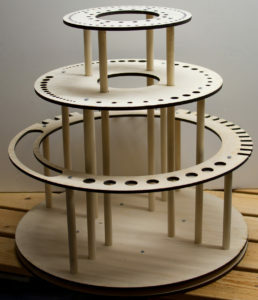 The base is 400 mm / 15.75 inches in diameter, the top shelf is 385 mm / 15 1/8 inches high (measured from the tabletop). The fittings on the top shelf are 5mm and 7.5mm diameter holes. 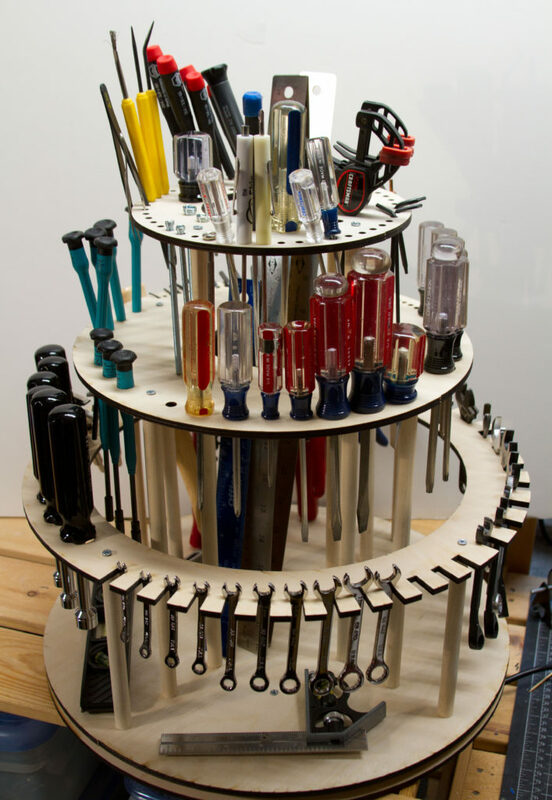 a 30mm wide rest for pliers and larger, tools that rest on the base of the organizer. The base has room for larger instruments like squares and levels that are not easy to suspend. Dimensions: diameter is 15.5″ / 40cm, the height of the top shelf is 14.5″ / 37cm. Customization is available, just let me know what you’d like. I can replace the wrench slots with more holes for screwdrivers, replace one set of Allen wrench holes with larger holes for screwdrivers, etc. I’ll estimate the cost, it could be as little as $5 depending on the complexity of the changes. The organizer comes as a complete kit as shown in the photos and includes printed instructions. All holes are pre-drilled, including the end holes in the support columns. The only tool needed for assembly is a Phillips screwdriver, should take 10-15 minutes depending on how good you are with a screwdriver. 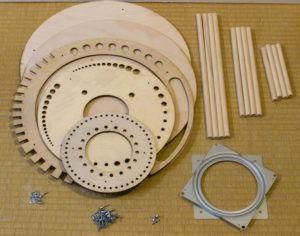 I make these kits in Pittsburgh, PA, using my Lasersaur laser cutter and hand tools. Fasteners are from American manufacturing suppliers.